Handy teacher's helper for the professional teacher or home school. 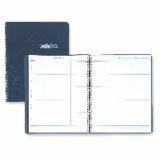 Features 41 undated weekly spreads each divided into eight periods with space for notes. 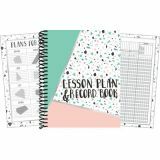 Includes extra pages for changes substitute teacher page seating chart important dates four semester schedule and note pages. 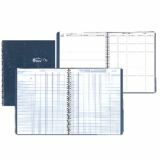 Durable blue leatherette cover stands up to ongoing use throughout the year. 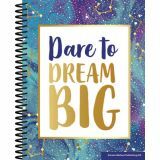 Strong wire binding firmly keeps the planner intact throughout the year. Printed on 100% post-consumer recycled FSC certified paper with soy inks. Made of recycled material; the wire is 90% recycled and book covers are 50% recycled. Made in the USA. Measures: 8-1/2" x 11". 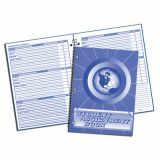 A Non-Dated Assignment book for intermediate grades, wire bound with a durable laminated cover. Non-Dated accommodates 40 weeks of assignments. Space for eight subjects per day Monday through Friday. Three-hole punched to fit in standard three-ring binder. 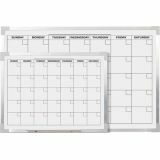 Durable colorful laminate cover stands up to ongoing use throughout the year. 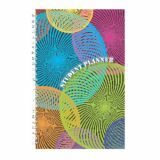 Strong wire binding firmly keeps the planner intact throughout the year. Printed on 100% post-consumer recycled FSC certified paper with soy inks. Made in the USA. Measures: 7" x 11".